Astrophotographer Daniel McVey sent in this photo of Orion taken in Colorado, Dec. 11, 2012. 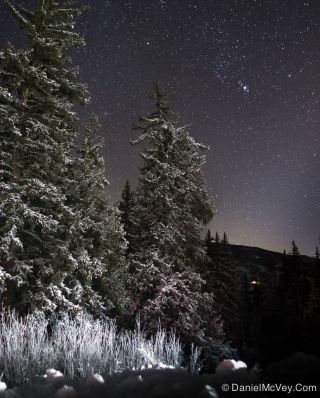 He writes: "Snow covered trees and Orion high in the sky are sure signs that winter has arrived in Summit County, Colorado." This scene is actually composed of two photographs stitched together in Photoshop. At 6:12 a.m. EST on Friday (Dec. 21), the sun will reach a point where it will appear to shine farthest to the south of the equator, over the Tropic of Capricorn, thus marking the moment of the winter solstice — the beginning of winter. Since June 20, the altitude of the midday sun has been lowering as its direct rays have been gradually migrating to the south. The sun's altitude above the horizon at noontime is 47 degrees lower now, compared to six months ago. Your clenched fist held at arm's length measures roughly 10 degrees, so the sun at midday is now nearly "five fists" lower in the southern sky compared to on June 21. The ancient skywatchers had no understanding of the sun's migration; they thought this celestial machinery might break down someday, and the sun would continue southward, never to return. As such, the lowering of the sun was cause for fear and wonder. As "armistice" is defined as a staying of the action of arms, "solstice" is a staying of the sun's apparent motion over the latitudes of the Earth. At the summer solstice, the sun stops its northward motion and begins heading south. When the ancients saw the sun stop and slowly climb to a higher midday location, people rejoiced; here was a promise that spring would return. Most cultures had winter solstice celebrations and some adapted it to other events. In Persia, the solstice marked the birthday of Mithra, the Sun King. In ancient times, Dec. 25 was the date of the lavish Roman festival of Saturnalia, a sort of bacchanalian thanksgiving. Saturnalia was celebrated around the time of the winter solstice. And in 275 A.D., the Roman Emperor Aurelian commemorated a feast day coinciding with the winter solstice: Die Natalis Invicti Solis ("The birthday of the Unconquered Sun"). Among the many varied customs linked with this special season for thousands of years, the exchanging of gifts is almost universal. Mother Nature herself offers the sky observer in north temperate latitudes the two gifts of long nights and a sky more transparent than usual. One reason for the clarity of a winter's night is that cold air cannot hold as much moisture as warm air can. Hence, on many nights in the summer, the warm moisture-laden atmosphere causes the sky to appear hazier. By day it is a milky, washed-out blue, which in winter becomes a richer, deeper and darker shade of blue. For us in northern climes, this only adds more luster to that part of the sky containing the beautiful wintertime constellations. Indeed, the brilliant stars and constellations that now adorn our evening sky, such as Sirius, Orion, Capella, Taurus, and many others, plus as an added bonus this winter season of the planet Jupiter, all seem like Nature's holiday decorations to commemorate the winter solstice and enlighten the long cold nights of winter.